Carved from a single large block of Italian Carrara Marble. This oval tub is very curved. Almost a blow shape. White peering through the slanted gray veining. A uniform round design to the lining. Consider installing these are stone baths before drywalling your home. Our expert teams are willing and able to answer your questions. 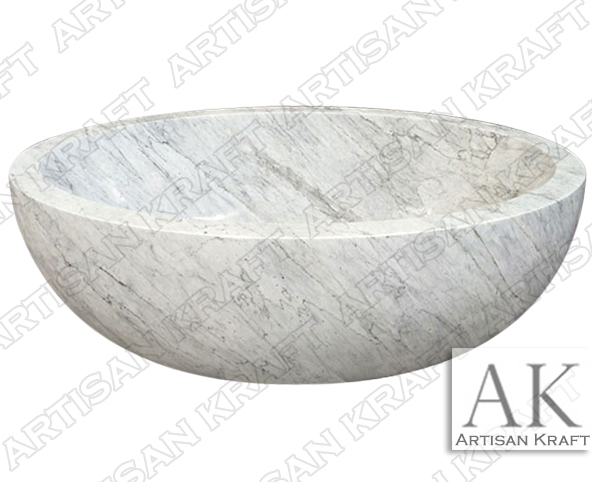 Artisan Kraft’s Chicago showroom has a marble bathtub display. Los Angeles showroom will be opening soon.